How to Easily Master Format NOKIA LUMIA 920 with Safety Hard Reset ? Tips and tricks and solutions for NOKIA LUMIA 920 problems. The smartphone with Microsoft Windows Phone 8 operating system which have good LCD screen and good camera 8 megapixel with Carl Zeis lens. NOKIA LUMIA 920 have several color in the market start with white, black, yellow, red and grey. We can choose which color we like at NOKIA LUMIA 920 body. Of course we still can give alternative cover with other color as well. NOKIA LUMIA 920 lcd screen have high resolutions and good color with IPS type, and also have adjust the screen sensitivity that we can move or touch to navigate the NOKIA LUMIA 920 although we use gloves. This is very important for country who have cold or snow which is many people use gloves and need to access touch screen without problem. What to do to Fix Problem or Recovery NOKIA LUMIA 920 hang or not responding or malfunctions or stuck or freezing or bricked ? The specifications of NOKIA LUMIA 920 is good because it have Dual Core 1.5 Ghz processor with 1GB ram will run almost all applications which can be download from Microsoft Market Place without problems. But as we know, some 3th party applications sometime can make problems or crash, this can make our NOKIA LUMIA 920 become hang or bricks or frozen or stuck or lcd touch screen not responding if we touch it. First we need to do soft reset or reboot our NOKIA LUMIA 920 to delete any temporary data or cache, because sometime these files can make problem with other applications or the operating system itself. If the problem still happen after we do soft reset, than we need to do hard reset or master format. How to Soft Reset or Reboot or Restart NOKIA LUMIA 920 ? The technology at NOKIA LUMIA 920 makes the battery is not removable. that is why we can not remove the battery for doing soft reset or restart the phone. If the phone frozen or hang when the screen on or in the middle of doing work, then you have to long press POWER BUTTON for several second, if you see ‘slide down to power of‘, do slide the phone then it will turn off. We need to press Power button again to turn on NOKIA LUMIA 920 on again. How to Master Reset NOKIA LUMIA 920 to Factory Default ? The NOKIA LUMIA 920 will do the hard reset format, wait about three until five minutes. While waiting you will see the gear appear until it finish. How to Restore and Reinstall Clean Windows Phone 8 operating system / firmware at NOKIA LUMIA 920 ? Some problem happen in our NOKIA LUMIA 920 can make the operating system become damage and need to be reinstall or restore with the right and clean factory default one. The source files of Microsoft Windows 8 already saved inside NOKIA LUMIA 920 rom. We do not need to copy anything when we want to do reinstall the operating system or firmware. Follow the simple step above (you can choose option 1 or option 2) to hard reset or master format, than the operating system will be reinstall automatically. After finish doing reinstall, we need to do setup NOKIA LUMIA 920 again from the beginning. How to Unlock or Fix or Bypass or Solutions for NOKIA LUMIA 920 forgot password code or security lock screen pattern or pin (lost password)? With the big internal memory at NOKIA LUMIA 920, sometime we have a lot of important data or pictures or videos inside the internal memory. We are very recommended to give security protection when the phone away from us. Lock screen is important for our NOKIA LUMIA 920. But how to bypass it if we forget the security password protection? If we forget the answer, then we do not have other option except to reinstall or hard reset NOKIA LUMIA 920. How to Improve Performance NOKIA LUMIA 920 to make run more faster? By default the running process to rung Microsoft Windows Phone 8 will be run without problem at NOKIA LUMIA 920, because it have good processor specifications. But some user feel the NOKIA LUMIA 920 become slowly after use several months. Usually many NOKIA LUMIA 920 problem like this happen because there are software problem, sometime too many installed applications can make our smartphone become slowly. We can try to reduce the installation by doing uninstall not use applications. But if we want to make the performance of NOKIA LUMIA 920 back to faster like new again, then we need to consider doing hard reset or master format. 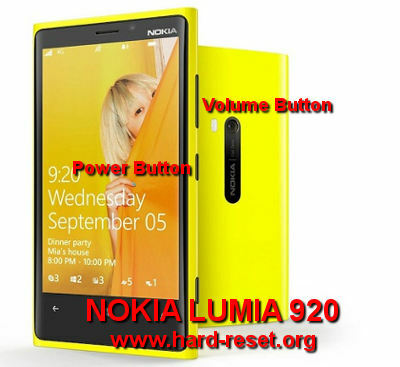 What is the Secret Code Key for Hard Reset NOKIA LUMIA 920 ? There is no secret code for doing hard reset or master format NOKIA LUMIA 920. Just follow the step above to hard reset is the easy way to do. How to Upgrade NOKIA LUMIA 920 to Microsoft Windows Amber or GDR2 Update Operating System ? If the update ready for this smartphone, then we can download and follow the step, but the NOKIA LUMIA 920 will give suggestion to use Wifi internet connection to download the update. Please remember, the good hardware and big storage at NOKIA LUMIA 920 will make user feel so easy to install or try many applications from Microsoft Market Place, but as we know with the above information, too many applications can make the NOKIA LUMIA 920 become more slowly or act not normal, different speed if compare by the new one. In some situations, the user need to hard reset the NOKIA LUMIA 920 to make it back to normal again, but doing hard reset or master format will removed or wipe or delete our important data and installed applications, so we need to backup to external media before doing master format or hard reset NOKIA LUMIA 920. The information from this page describe about nokia rm 920 security code,hard reset a nokia lumia 920,hard reset rm 920,lumia rm 920 hard reset,movistar nokia lumia 920 reset with sotware,screen lock lumia 920. If you need another resource for hard reset, use search function at this homepage or find from our related posts.